FFXII: Revenant Wings is the poster child of a game trying to sell on name alone. 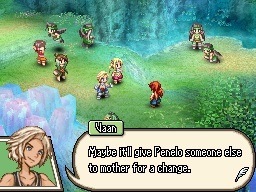 Despite the show of the main characters, the game can barely be related to FFXII at all - the world is transfigured, the gameplay shares almost no similarity whatsoever, all the characters have perplexingly changed their personalities (except Balthier and Fran), and the plot is now a light-hearted, saccharine affair about the boundless joy of being a skypirate and saving some floating island denizens. Since FFXII was already so controversial among fans, I expect that whether this is a good thing or not will depend on what you thought of that game... but with the risk of editorializing a bit, I think this was an extremely disappointing change. However, If you manage to look past this what's underneath is still an ok videogame. As the story goes, Vaan finds a mysterious ship which he boards and manages to get control of. This eventually leads him to a mystical floating island, which is apparently under siege by various sky pirates. Being the noble kind-hearted soul you are, you promise to help the creatures of this floating island overcome this challenge. To do this, you'll be waging various battles which are a weird blend of real-time strategy games, and traditional SRPGs. The primary fault of FFXII:Revenant Wings is in its inability to actually go further with its promising gameplay concept, because all its strategic elements are only kiddie pool deep. In any given battle, you're able to choose leaders... these leaders are your primary characters (usually called generals or commanders in other similar RTS games), whom control underlings (troops, here called Espers) to destroy the opposition, mine different materials and occasionally capture a summon point or destroy an enemies crystal. Utilizing a basic rock-paper-scissors strategy system, your troops are broken down between melee, flying and ranged classes which all have an advantage over one of the others. 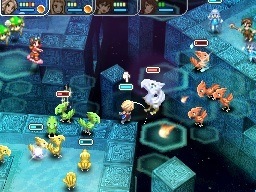 The game adds a bit more strategy by allowing you to expand your collection of possible Espers, to gain stronger allies. A Rank II monster is obviously better than a Rank I, and so on and so forth. By winning battles you'll be given the material needed to unlock further monsters. You can bring more monsters into battle by using summon points, which are essentially bases which either side can control. Outside of the consideration of which of the three esper types you use, there's really very little compelling strategizing - it all becomes pretty superficial after that, and you can get by pretty easily by merely overwhelming your enemies with force. Even on the occasion the game throws out a twist, such as protecting your crystal... it fails to elevate itself beyond the simplest of tactics, which is never a good sign for a strategy game of any type. On the positive side, the controls are fast and effective... dragging your stylus can highlight all your troops at once, leaders are controlled by simple tabs, and sending your minions all over the place is easy and satisfying as a result. If nothing else, this is certainly the type of genre that benefits most from the use of the DS stylus and dual screens, and it is used to impressive effect here. There's little micromanagement needed to really give the controls a workout, but the groundwork is here for future installments which may decide to throw a little more strategy with the game. One of the few times FFXII: Revenant Wings seems to try to connect to its predecessor is when it introduces Gambits, which if you remember from Final Fantasy XII is a brilliant A.I. customization system which allows you to automate what your team does with pretty startling precision. Problem is, it's an insult to that system that this one is even called "Gambits"... your leaders can utilize only one at a time - ONE - which pretty much reaks of lazy developer and strips any and all desire to utilize the system in any way. It's bastardized to the point of uselessness, and the only reason it's even here is to add a bulletpoint which allows them to say it's cut from the same blood as FFXII. Again SquareEnix shows that it has the best grasp of the DS hardware, and pushes "impressive-for-the-system" 3D which lends the appropriate flair to the proceedings. Unfortunately in my experience, the game has some heavy framerate drops when you get a sizable number of units on the screen, which causes some battles to feel sluggish. It's not too distracting, though, and if you're not sensitive about that sort of thing it won't really matter. Accompanying the nice presentation is a fantastic music score (much of it borrowed from the already great FFXII soundtrack) and it's a joy to listen to with headphones on. What you get from FFXII: Revenant Wings really depends on your expectations for games of this type. When a game is supposed to be strategic, I expect strategy... and when it fails in that regard, I personally cannot believe it's a great game. That's not to say FFXII: RW is bad or that it isn't competently designed, it's just that it could have been much more and it's sort of infuriating to know it isn't. I hope that if we get another strategy game of this type, the meat on the bones won't be this anorexic and I'll be able to really dig in and appreciate the gameplay a little more.